To complicate things, I had to make them the same day — at the same time — that I made Nathaniel’s birthday cake. I had plans the next day to visit Eastern District, an awesome cheese shop in Greenpoint, Brooklyn, owned by my friend (and former boss) Beth and her husband Chris. I’ve wanted to go there for ages, and I knew that they would be the perfect consumers for these cheese-featuring treats. (And I knew my kids would not, thanks to the cayenne. Nathaniel will try just about anything, but he doesn’t like too much of a spicy kick in his food.) Also, it made the day more hectic, so why not? 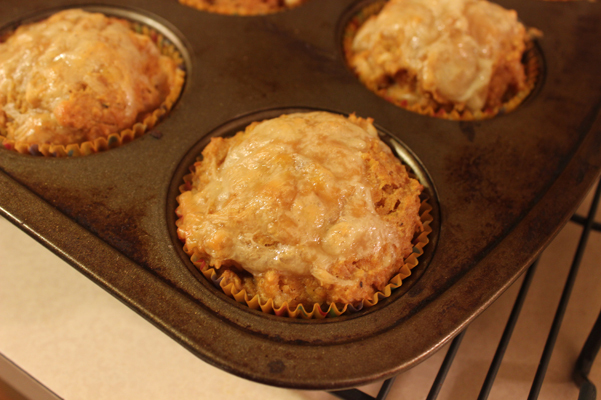 Why just make a layer cake with two soda reductions when you can make muffins at the same time? 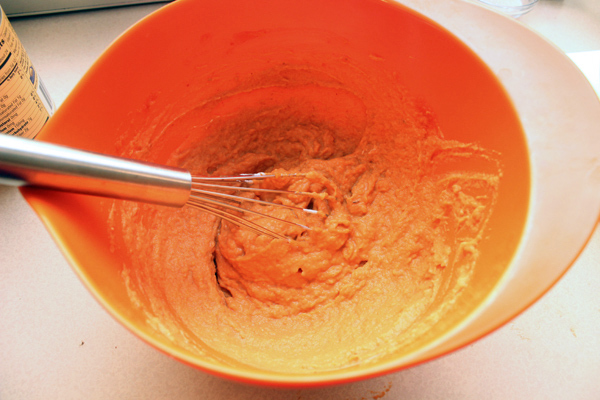 I whisked together the pumpkin and the sour cream first. Forgive me, I used a “light” sour cream. Habit. I added the eggs next, and instead of half a cup of butter, I used a quarter cup of butter and somewhere between 1/8 and 1/4 cup of low fat vanilla yogurt. Had to lighten this one up a bit, if only to feel better about the delicious cheese. 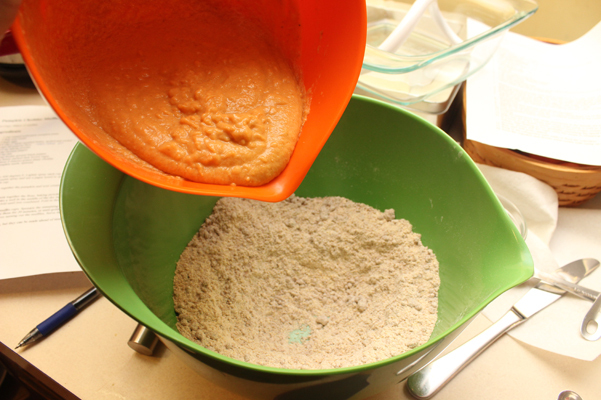 In another bowl, I combined the dry ingredients, substituting whole wheat white flour & wheat germ for the all purpose flour, then adding baking powder, salt, cayenne pepper, black pepper, and brown sugar. 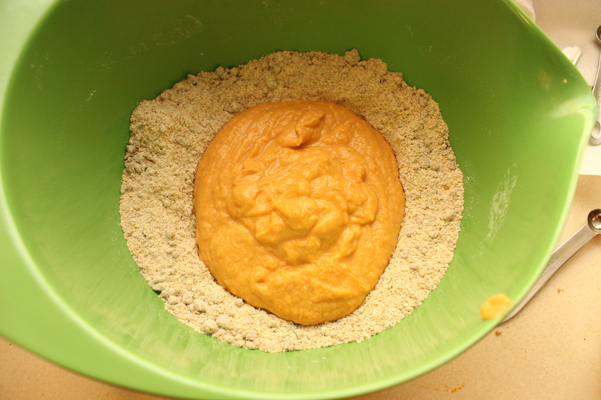 I confess that I have never put cayenne pepper in a baked good before. It was a big moment. Next, the combining. 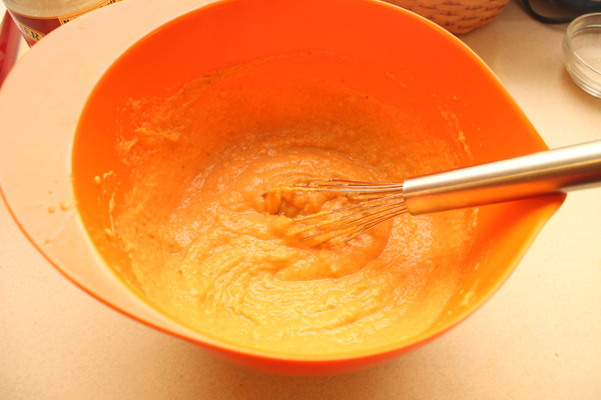 Pumpkin, meet cayenne. And then they were all introduced to the cheese. 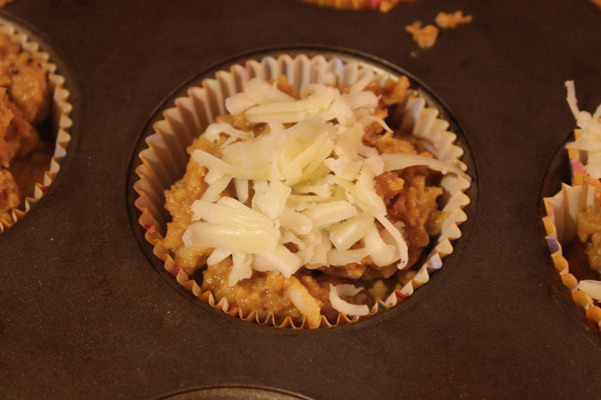 I took three quarters of my grated cheese and folded it in to the batter, then scooped the batter into muffin cups. A bit of the remaining cheese went into my mouth, and the rest was used to top off each muffin. Things like this bring out the Homer Simpson in me. Mmmm….cheese. I baked them for just under 20 minutes. I didn’t write it down, unfortunately, probably due to the fact that I was also getting my frosting equipment together at the same time. 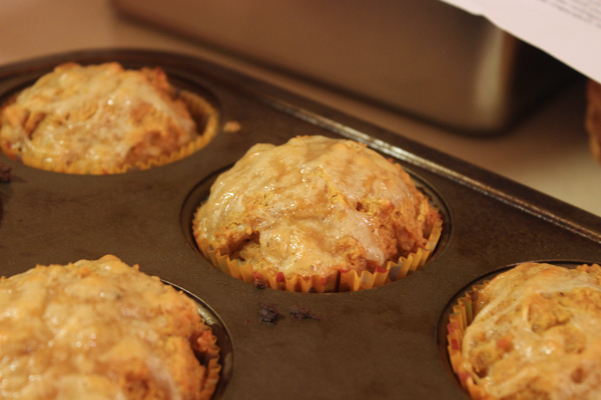 The cheese melted beautifully, though, making the muffins a bit alien-like but not in a bad way. I gave them a few minutes in the pan, and then got them out onto the rack. They smelled amazing. They were delicious. Divine. And distinctive. I’m definitely going to bring these to my Dad’s for Thanksgiving, along with my now-signature pumpkin cheesecake with cinnamon chai frosting. They have a touch of sweetness from the pumpkin and the dark brown sugar, but they’re savory, and I think they should be served with dinner and not dessert. 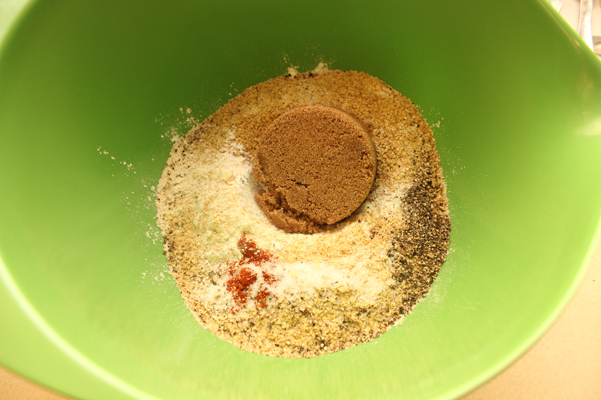 I love the kick that you get from the cayenne and black pepper, it’s like a little bite right at the end, but it’s never overpowering because of how well the other flavors combine. 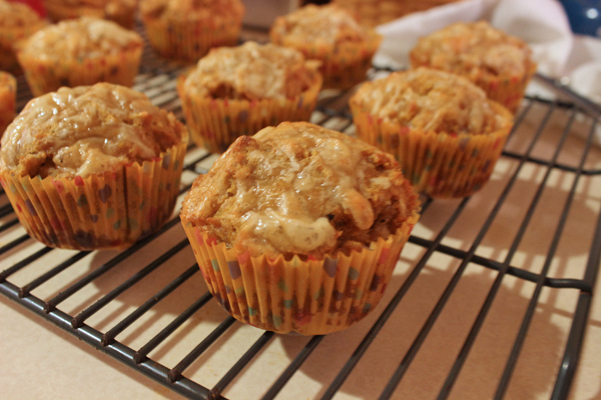 A winning recipe this one, and a nice step out of the usual for me, although of course they are still muffins. I know I make a lot of muffins. People say things. Then they stop talking because they’re too busy eating muffins. Melt the butter, and set it aside to cool. Grate the cheese. Heat the oven to 425, you will reduce the temperature later. 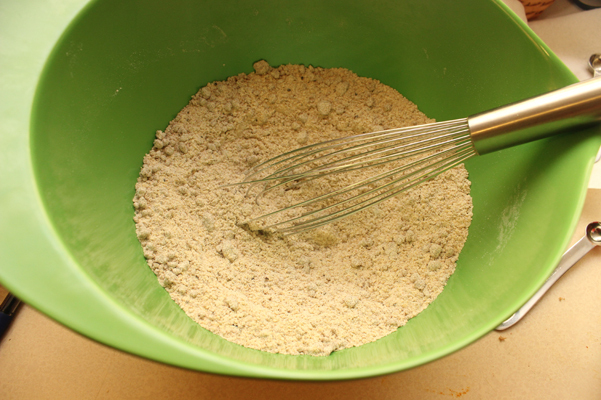 Grease or line a 12-cup muffin tin. 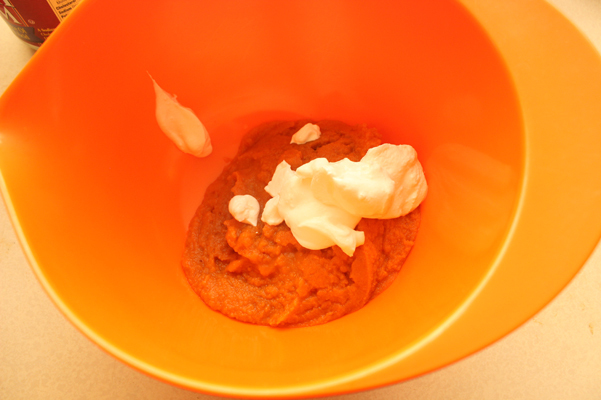 In a medium bowl, whisk together the pumpkin and sour cream. 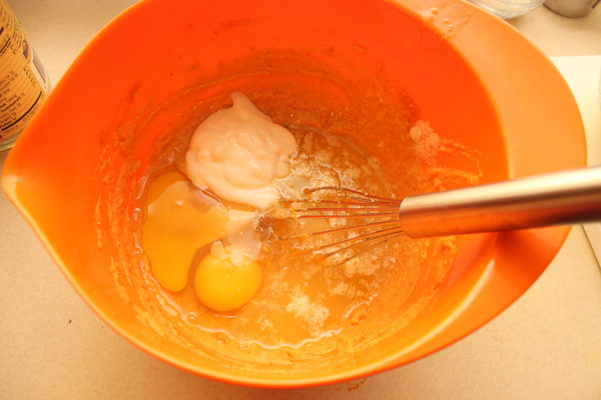 Add the eggs, butter, and yogurt, and whisk until thoroughly combined. 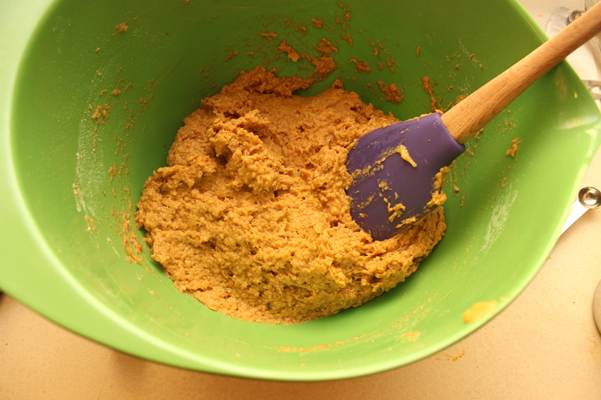 In a large bowl, whisk together the flour, wheat germ, brown sugar, baking powder, salt, black pepper, and cayenne pepper. Make a well in the center. 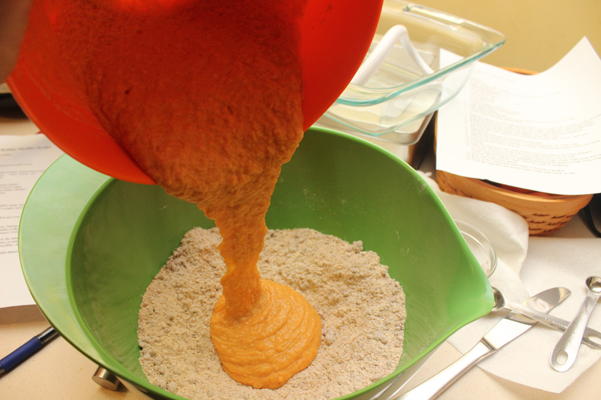 Pour the pumpkin mixture into the flour mixture and fold, just until combined. Don’t overdo it. 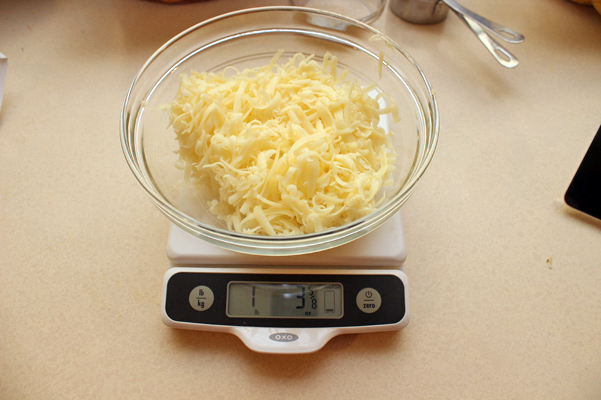 Fold in three quarters of the cheese. 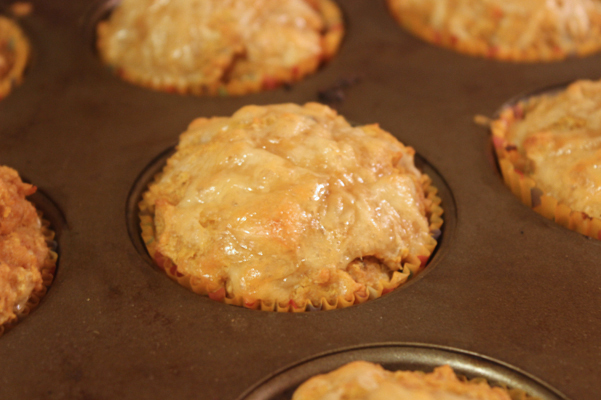 Scoop the batter into muffin cups and top each one with the remaining cheese. Reduce oven temperature to 400, then bake for 15-20 minutes, until golden brown on top, and a toothpick inserted into the middle comes out clean. For the best muffin experience, serve warm, but they’re pretty delicious even if you don’t have a chance to warm them up.